Serve your customers a taste of the shore, delivering rich seafood flavor in a creamy and satisfying soup. 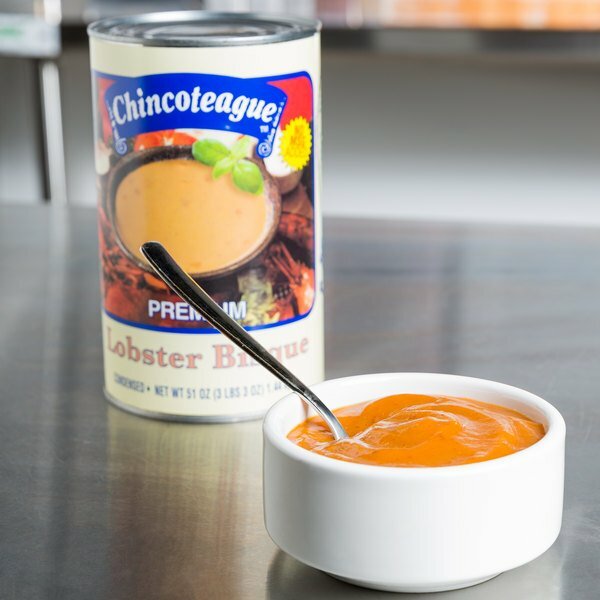 Combining tender real Maine lobster meat with a unique cream base, plenty of Grade A butter, and a dash of sherry, this Chincoteague condensed lobster bisque features full-bodied flavor that's sure to please. Since 1955, Chincoteague's family-owned business has featured canned options for top quality seafood and fresh ingredients with gourmet flavor. Offering a homemade taste, Chincoteague soups have no preservatives, artificial colors or flavors! This soup is easy to prepare, lessening prep time and strengthening good service, and its hearty consistency makes it a welcome addition to your menu. The savory taste of fresh lobster meat mixed in a velvety smooth base makes for a flavorful entree or appetizer. Serve with salty crackers, pair with fresh seafood offerings, or use in other gourmet creations! Empty contents into a saucepan. Add an equal amount of milk to each can. Heat slowly, stirring often until evenly blended. DO NOT BOIL. For a richer bisque, prepare with less milk or use light cream. Garnish with additional sherry or butter, if desired. This worked as a good base for a dish for a large gathering. It, as have all my orders, arrived in great condition and in a timely manner! Made with Maine lobster meat (2nd ingredient after water), butter, cream, and sherry. Tastes great with added milk, but also great as a base for seafood recipes. This is a good lobster bisque. It isn't often that you find this in canned form. The people who ate this really enjoyed it. It actually has lobster meat in it and not imitation. Really good flavor and makes a great base to use to build a better bisque. We add a bit more lobster but it is really not necessary with this soup. ANOTHER GREAT SOUP FROM THIS LINE. STRAIGHT FROM THE STOVE TO THE TABLE NOTHING TO ADD GREAT TASTE AND BODY. THE PRICE WAS GREAT FOR THE QUALITY OF THIS PRODUCT. 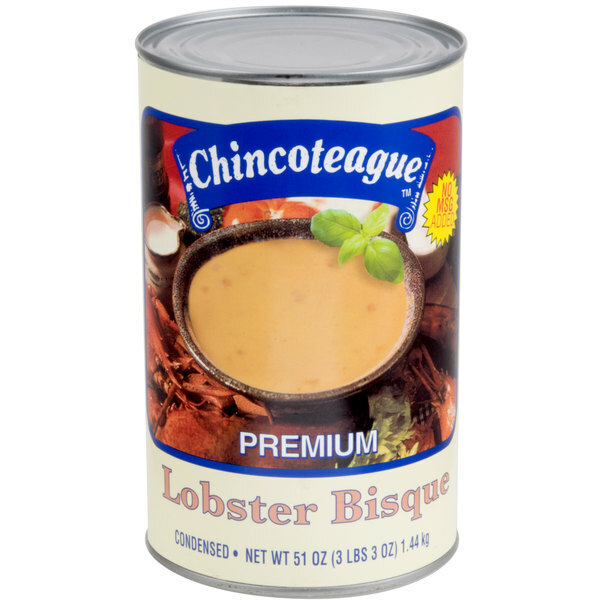 Chincoteague Condensed Lobster Bisque - 51 oz. Can - This soup is absolutely delicious, very flavorful. We mixed it with whole milk and got rave reviews. I will definitely be ordering it again. The Chincoteague condensed lobster bisque is wonderful and so rich and bold in flavor. A great bisque and terrific for our sweets shop and deli. Pretty good lobster bisque. It has a medium-strong lobster taste and some taste of tomato as well. It is well seasoned (not too much), and is best served if you add a little more dry sherry and half-and-half instead of milk. For a richer soup, I recommend cutting down the half-and-half by half or simply using cream. The lobster bisque is exquisite and has a marvelous taste and smells wonderful heating up. The lobster bisque is a wonderful opening to any meal. A delightful condensed lobster bisque is quick to prepare. Great rich flavor that you and your guests will love. The bisque is warm and delicious. The condensed lobster bisque is rich and creamy and makes for a great soup. The bisque is a great consistency and has a great flavor. A very flavorful and rich lobster bisque that is seasoned perfectly. We were super surprised to get such a great taste bisque out of can. Our customers love it, and we love the price. I'm always looking for a great lobster bisque in a can. This one was a little too peppery for me - but I'm pretty picky. Everyone else seemed to love it. This red crab vegetable soup has real crab meat as the third ingredient and with lobster and beef flavor. It is pretty good for a soup. Very flavorful soup. No large chunks of lobster. I served this to some lunch guest and they all enjoyed it. Will be purchasing again. The large can I know is for restaurants but, I bought it for home use and the size and amount helps when serving a large gathering. The lobster taste is outstanding! its extremely bold and you taste it right away. i plan on ordering a lot more, i reccomend it! its delicious! This lobster bisque is superb. It has a lot of lobster flavor this some of the best I have ever eaten I will be buying again.